Algebra is using letters (or other symbols) to represent an unknown number. An equation that uses algebra is called an algebraic equation (note that algebraic is the adjective for algebra). What Is an Algebraic Equation that Contains Addition? An algebraic equation that contains addition is an equation with at least one letter being used to represent a number and with at least one addition. 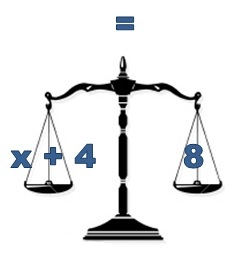 In the equation above, the x represents a number. 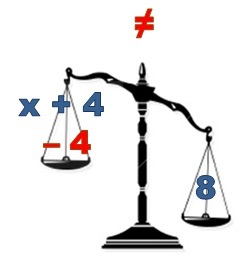 In words, the equation means "x plus 4 equals 8". To solve the equation, we have to find the number that, when you add 4 to it, equals 8. Question: What is the value of x in the equation below? The key to solving an algebraic equation is to isolate the letter (or symbol) you are trying to find the value of. This is done by rearranging the equation so that you just have x on the left-hand side of the equals sign, and the answer on the right-hand side. Whatever you do to one side of an equation, you must do to the other side! Look at what has been done to the x. Find the opposite thing to get x on its own. Do this to both sides of the equals sign. 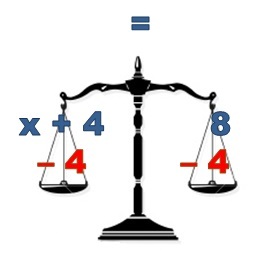 This slider gives another example of solving an algebraic equation that contains addition. You can think of this of as 'switching sides, switching signs'. The 4 has moved from the left hand side to the right hand side of the equals sign; and has changed to having a + to a - in front of it. This can be done to any term that is an addition or a subtraction.